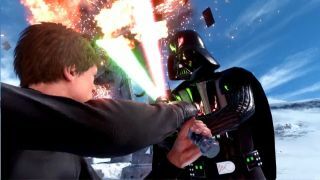 We know that EA's upcoming, annoyingly numberless Star Wars Battlefront will feature playable goodies and baddies including Luke Skywalker and Darth Vader—but what we don't know is whether the celebrated Heroes vs Villains mode will return from Battlefront 2. Well, I say we don't know that, but we kind of do now, thanks to the Spanish version of the official website. It's just blabbed some or all of the multiplayer modes that will be included in the game: Supremacy, Fighter Squadron, Blast, Drop Zone, Cargo and Heroes vs Villains. "In addition to Walker Assault, Star Wars Battlefront will feature immersive, fun-filled multiplayer modes including Supremacy, Fighter Squadron, Blast, Drop Zone, Cargo, and Heroes vs Villains mode, that will be announced in the months ahead. Stay tuned for more information on these exciting multiplayer modes." As PCGamesN note, you can check the Spanish Battlefront site for yourself, by clicking this link and opening it in an Incognito window in Chrome (or whatever the equivalent is in your browser of choice). Ctrl+F confirms that the words "Héroes contra villanos" are mentioned, which you don't need a degree in Spanish to figure out. What was Heroes vs Villains? It was a big deathmatch mode that pitched famous Star Wars good'uns and wrong'uns against each other. In other Battlefront news, EA have confirmed that there won't be a map in the game based on the Death Star. Boo!